"I like how real this mandolin pickup sounds. It sounds great in a small setting and on a big stage, as well. I’ve used mine on both. Very, very great mandolin microphone!" As with every model in our Feather Series, our original Feather allows incredible versatility. Mounts on almost any instrument without need for modifications. Caleb Edwards, originally from Metamora, Indiana, has been playing mandolin since the age of 12, emerging in the Cincinnati and Indianapolis music scenes as a unique songwriter, mandolinist, and vocalist. 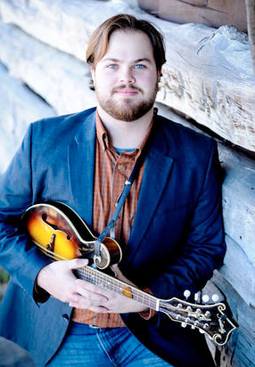 A graduate of the Kentucky School of Bluegrass and Traditional Music, he's studied under legends such as Bobby Osborne, and Newgrass Revival's Curtis Burch. He is fluent in jazz, rock, and classical as well as bluegrass, and brings a bit of it all to each performance. Caleb moved to Nashville in the summer of 2014, shortly after getting married and joining Fireball Mail. Caleb hones his musical chops by performing with Fireball Mail, touring with eclectic bands across the country, session recording, and teaching music lessons online and in person.